On November 22, 1963, President John F. Kennedy was assassinated by Lee Harvey Oswald in Dallas, Texas. This Dow Jones News Service ticker tape tells the story of that day as it happened. 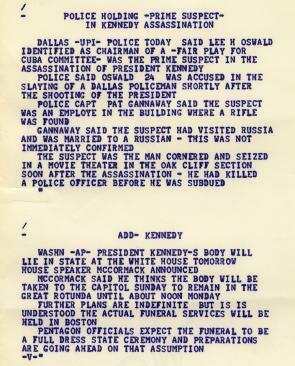 The fifteen sheets span the entire day of the assassination. The tape starts out mundanely enough, noting Kennedy’s morning speech in Fort Worth and his plans to appear in Dallas later in the day.